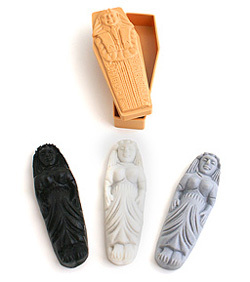 The magician displays 3 mummies (black, white and grey) of equal size and shapes, and a plastic coffin. He asks a spectator to place a mummy of his choice secretly inside the coffin, to put the coffin (lid closed) back onto the table and to put away the other two mummies. Now, without either touching the coffin or going near the table, the magician reveals the color of the mummy inside the coffin. • Easy to do, can be immediately repeated. • Pocket-size. Take anywhere you go. • The coffin is cm 9 x 3,5 (in. 3,5 x 1,4).